Home » NHCC » THANKS NH CROSS COUNTRY COMMUNITY!!! As Indoor Track gears up and Cross Country winds down, I wanted to take an opportunity to thank all those that work tirelessly behind the scenes in order to make running Cross Country in New Hampshire one of the best high school experiences an athlete can have. The list of people that have a hand in making the season great is extensive, and I’m likely to leave someone out, but I feel many overlook how dedicated and hard working some people are even though there is no direct benefit to themselves. First and foremost is Larry Martin, Mr. NH. Larry’s been at the forefront of NH Cross Country since I began coaching 19 years ago. At the time, he was “running NHCC” sending out the newsletter which meant collecting and collating meet results, affixing mailing labels and getting them out to subscriber’s in a timely fashion, all while teaching and coaching his own team. Now retired, it seems he’s taken more on, playing a bigger role in meet management, being the liaison to the New England Council, and stepping in to announce the biggest races in NH, including New Englands this year. Not to mention all the work he does with the All Star banquet where we get to honor the best kids in our sport and likely across all sports. Certainly Larry’s presence is visible, however the amount of behind the scene work he does is not. Tim Cox and Greg Hall of NHCC.com and NHTF.com. Tim and Greg run the website, the only one out there that does what it does with as much success as it has, and is totally free. With the addition of the Ranking’s Reveal (the kids did great! 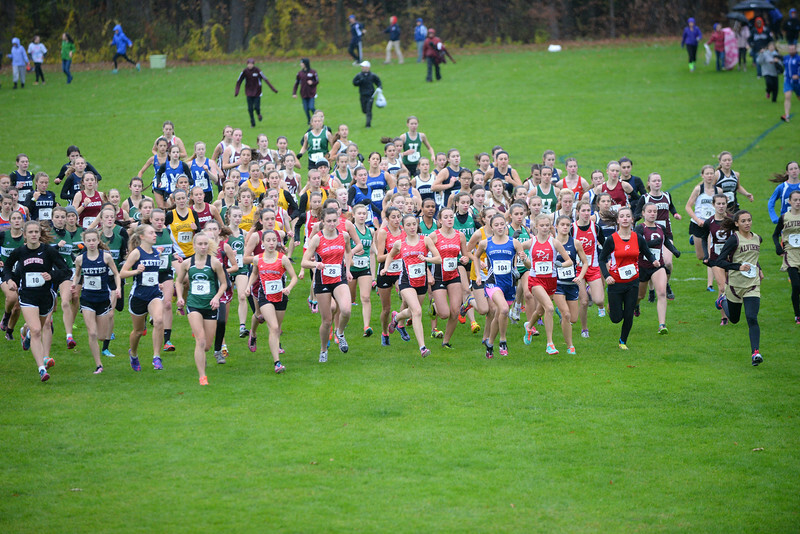 ), more race coverage and interviews, and the new database of races at Derryfield Park and New Englands, the site keeps getting bigger and bigger. These guys juggle all this, while coaching one of the top programs in the State, and teaching, showing their dedication for the sport beyond their own team. Both Tim and Greg would tell you that they couldn’t do it without the dedicated crew willing to take on the many duties that goes along with the website. The list is extensive of people willing to man the cameras, provide audio, do interviews, write articles including previews and recaps, aid with the rankings and generally just pitch in and help. I would be remiss in not recognizing Dave Scannell and Davio DeLuca for their work behind the lens, photographing as many events as they could, providing free, downloadable images right off the website. And let’s remember, all this work this year took place in conditions unfit for running, making coverage extremely challenging as well. Thank you to the coaches that lent their expertise and experience to the Championship broadcasts. Nate Leveille, Amy Sanborn, Corey Dowe, Liz Danis, Peter Attisano and Jim MacKenzie did a phenomenal job giving voice to the action that was playing out on the course, providing background to teams and individuals and simply calling it like they see it, helping those that might not have the knowledge or background in the sport understand what’s going on before their eyes. I also want to recognize Runner’s Alley, for their support of the NH Cross Country scene. Their interest and financial investment is what allows for the video and online coverage NHCC.com provides. Their Team Nights, where the focus is on the athlete and their needs are phenomenal. It’s nice to have a partner that is as interested in the experience of cross country, not just the financial gain it might provide. I want to recognize Rick Berryman and his crew at LancerTiming. Let’s face it, many of us have never seen the conditions we saw this fall for the three successive weeks of championship racing, making timing a difficult proposition. With the addition of chip timing and no chute, athletes were able to be shunted off the course and back to warm tents and a drier, warmer change of clothes. Thanks to the NHIAA for “staying the course” and helping us get these championships in. In other sports, make up contests are common but for our sport, with so many entities in play, letting the competition sort everything out was good for those athletes and teams competing. Recognizing the grit of cross country was a good decision for all athletes. And finally, a shout out to all the people that helped get the courses at Derryfield Park and Mine Falls ready for championship racing. The NH committee along with Manchester Parks and Rec did a great job getting the course ready over the season to host New Englands, then Mother Nature did her best to ruin it. I was on hand early at both the Divisional meets and New Englands to help with course set up and the amount of work necessary to get the course in a condition to be runnable was incredible. Lee Hess did a tremendous job collaborating with the city while Tim Cox was able to “get boots on the ground” to set up fencing and to cordon off the finishing straight in the predawn hours on both occasions. The Nashua South community was on hand early at Mine Falls, checking the Arthur Demers’ designed course and making last minute adjustments due to the weather. I’m sure I’ve left some people out in this! Thanks. 2018 was a great season all around, even without the help of Mother Nature. As Cross Country winds down, I look forward to working with many of these fine people again throughout the Indoor season. Onto NHTF! Thank you Mike Smith! Well said! Happy Thanksgiving to the best community in NH! Well said Mike! Best of luck to everyone competing and NXR and Foot Locker today! Next post 2018 Northeast Regionals! What to Watch For!